I’m so bummed. 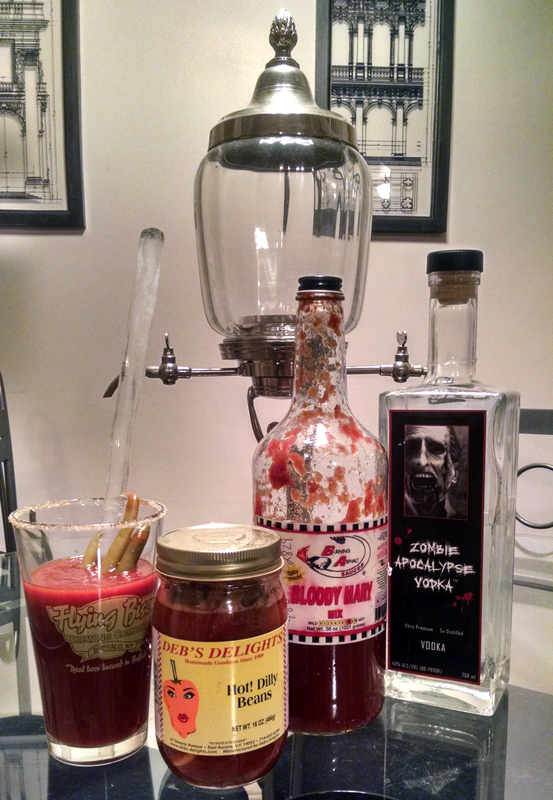 Today was the Brooklyn Bloody Mary Fest, and I was not there. I really wanted to go when I first heard about it last year, but my job makes us choose our vacation time in November for the following year, and no date for the fest had been chosen yet when I was forced to pick my dates. Boo! 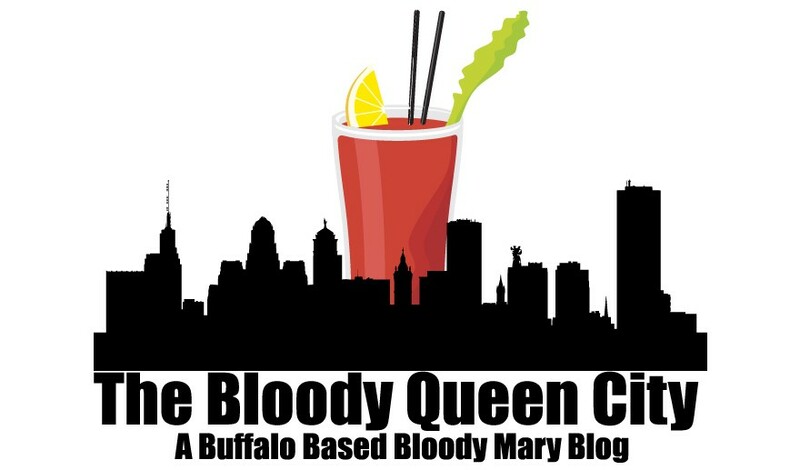 Now I’m fantasizing about creating a Buffalo Bloody Mary Fest. I also found out about “Embrace the Brunch”, a fundraiser for Embrace WNY, where various local restaurants donate a portion of their brunch proceeds to the organization. This weekend was Merge’s turn, but since I still can’t find anyone to go to brunch with me, I didn’t make it. I do a lot of things alone, but I feel like brunch alone would be the ultimate in sadness. So much yumminess missed this weekend. I had to take things into my own hands. I’m so excited. 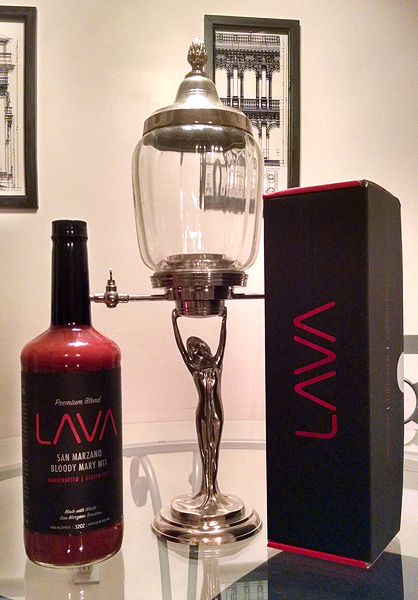 I was contacted by the CEO of Lava Bloody Mary Mix, offering to send me some of their mix to try! It arrived on Tuesday and was waiting for the weekend to give it a try. I had to bump it ahead of all those other mixes, or it would be forever until I got to sample it. I felt it was only right to taste it in a timely manner. Lava, dubbed the world’s best Bloody Mary mix, is made from San Marzano tomatoes – said to be the best tomatoes in the world. (I tried to grow San Marzano tomatoes in my garden last year, and it didn’t go well. But I don’t blame them, none of my tomatoes grew well last year, tons of issues, ugh.) Handcrafted in small batches from a family recipe that has been refined over generations, Lava is non-GMO and gluten-free. A 32oz bottle is listed at $14.95 on their website, so it’s a bit more expensive than your typical mixes. Is it worth it? Well first of all, it comes in that fancy box. It’s really slick looking, but if it was on a shelf in a store, I’m not sure I’d know it was a bloody mary mix. Secondly, and most importantly, this is one good mix. It just tastes fresh. It doesn’t taste fake or chemically at all, which is nice in a bottled mix. It’s a tad sweet, and I wasn’t sure if it was going to be spicy, despite the lava name, but it definitely is. You can see pepper visible in it, but it’s spiced with something else too, without any vinegar taste like you get from Frank’s hot sauce and other hot sauces. The spice lingers on your tongue, which is always a plus. It’s got a great liquidity, and if you’ve been paying attention to this website, you’ll know I can’t stand super thick chewy mixes. You can tell it’s not mass-produced, as the mix still has little traces of tomato pulp (for lack of a better word). It’s not pureed beyond recognition so it feels like it’s something you just made up in the blender for a special brunch. It’s really very nice, and I’d say worth the price. I would definitely buy it. I’m back on my “special assignment” with the normal schedule so I have 9 more chances to get someone to go to brunch with me (since it’s definitely not happening this weekend, it’s St Patrick’s Day in Buffalo tomorrow!) Anyone, anyone? Bueller? This weekend was supposed to be my last weekend off, while I was on “special assignment” at work. I had hoped someone would want to do brunch with me while I had weekends off so I could have some Bloodies, however it never happened. Well the good news is, in 2 weeks, I’m going back on “special assignment” for 10 more weeks. That’s 10 more chances to find someone, anyone, to go to brunch with me! Another thing I had been meaning to do while I was off was to finally try all the different mixes I have picked up over the months. I always seemed to end up with a headache every Saturday night though, so I’d pass every weekend. My lovely selection of mixes, minus a few variations that J still has at his house. 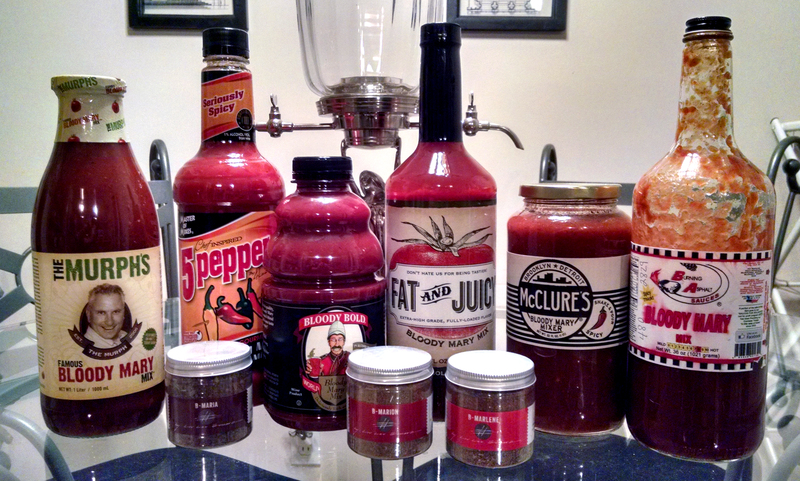 From left to right, The Murph’s, Master of Mixes 5 Pepper, Bloody Bold, Fat and Juicy (from Aldi! ), McClure’s and Burning Asphalt. I also have a set of spices J got me for Christmas that you mix into tomato juice to try sometime. Decisions, decisions, which one to try. I’ll go with Burning Asphalt, again. I have had this mix for about a year and a half now, and I did try it after I bought it. I was really excited when I bought it, because this local brand (really just a guy who makes sauces) makes really great spicy condiments, like habenero ketchup, and spicy hot pepper spread etc. He sets up his goods at various festivals and events around the Buffalo area, and I picked up the mix at Live at Larkin. It was a funny exchange, as the owner was convinced he recognized me from buying his stuff other places, though it had been years since I did. He was so convinced that he knew me, he wrote his phone number on the bottle, and offered to personally deliver me orders of more Bloody Mary mix if I liked it. Was that weird? Here it is! Shockingly, this is my first bloody mary I’ve ever made myself! When I’ve had them at home, J usually makes it for me. 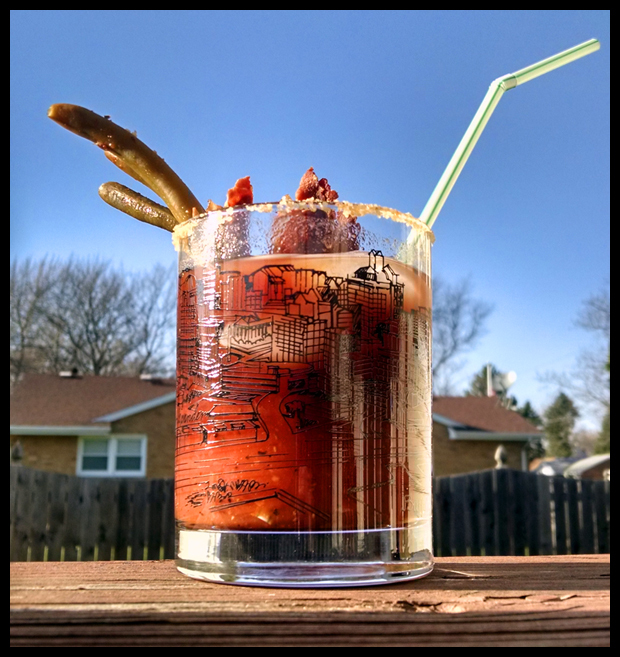 Burning Asphalt mix, sriracha salt rim, Deb’s Delights spicy green beans garnish, and a genuine artisanal Buffalo icicle, broken off my back porch. I was hoping things would be different this time when I tried it, because I so wanted it to be the best mix ever. But it is just too. damn. thick. It’s like drinking spaghetti sauce, or ketchup. It does have a great taste, strong full tomato flavor. A nice, not overwhelming spice level from habanero peppers and a tiny tang of horseradish that doesn’t hit you until after you swallow. It could be a bit spicier in my opinion, but it’s good. It’s really good. I just can’t get past having to chew it. I’m hoping my giant icicle waters it down enough for it to be palatable. Maybe I’ll cook with it, cuz I can’t let it go to waste! Deb’s Delights is another great local brand, that cans different kinds of jams, jellies, pickles, garlic, beans, etc. The spicy pickles and spicy beans are a-mazing! Woo doggy they are hot. I had to let my taste buds cool off before I tasted my drink. They used to only be available at various events and festivals too, but Wegmans started stocking them recently, score!